It began with the germ of an idea: University of Toronto students wanted to do something to help young Syrians newly arriving in Canada as refugees. Almost two years later, the small initiative started by students in U of T's Near and Middle Eastern civilizations department with volunteers reaching out to refugees at their hotels has blossomed into a full-blown program of Saturday workshops and field trips that has helped more than 150 Syrian newcomers. The language and cultural exchange taps into a volunteer corps of 200 people – students from across the three campuses, community members, faculty and a roster of 160 Arabic translators. 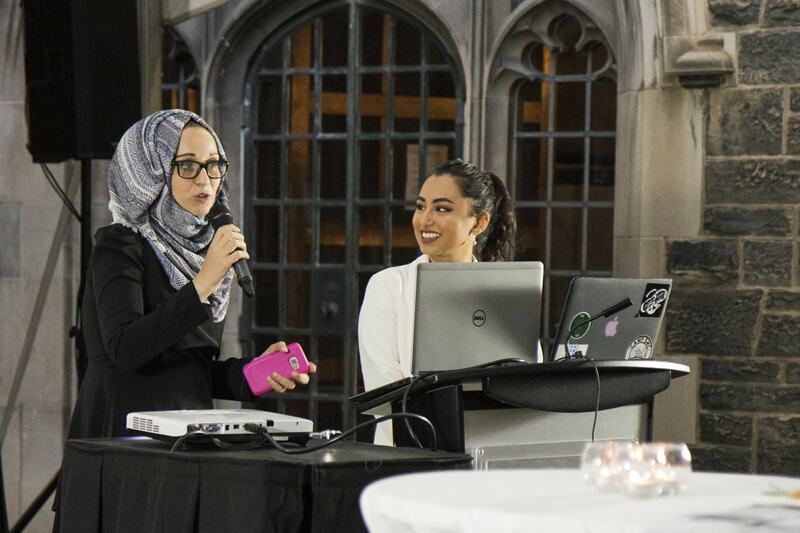 Last week, the Near & Middle Eastern Civilizations-Cultural Exchange and Support Initiative (NMC-CESI) celebrated how far it's come with an evening of music, food, speeches and art at Hart House. “When the government started talking about accepting Syrian refugees, my friend Rob asked how could we help. We’re not able to help people inside [Syria]. We should at least help the people coming here. We decided to do something,” recalled Rasha Elendari, co-founder and president of NMC-CESI, as she spoke to a crowd of supporters, U of T student volunteers and Syrian newcomers. At the weekly workshops, Syrian youths learn English and U of T students brush up on their Arabic. Some of the young Syrians are enrolled in full-time, English-language programs. At least one started classes this year at U of T Scarborough, and some have found jobs. NMC-CESI focuses on young people aged 18 to 25, a critical age for refugees because they are trying to learn a new language, finish high school and pursue universities and colleges. “We wanted to make sure that they have a community where they could feel belonging and interact with Canadian students their age to get assistance about applications, other important tests, and in return, they would exchange language and culture with the students who are learning Arabic and specializing in various Middle Eastern studies,” Elendari said. Syrian newcomers in the program say volunteers have helped them strengthen their language skills, as well as assist with school work. Sarah Lazakani has been attending NMC-CESI workshops for the past 1½ years. She was born in Syria and completed high school there, before fleeing with her family first to Turkey and then Lebanon. This fall, she joined U of T Scarborough for health studies. Hozana Omar also finished high school in Syria. She's now taking classes at an English-language school but comes to the NMC-CESI events for a place to connect with friends. “I meet Syrian people here. I meet different people from different backgrounds and also learn English language,” she said. The program is sponsored by the Faculty of Arts & Science, the department of Near and Middle Eastern civilizations and Victoria College. Hart House, the Munk School of Global Affairs, the Multi-Faith Centre, New College, Woodsworth College, the Arts and Science Students’ Union, School of Graduate Studies, and the departments of anthropology, political science, sociology and English have also offered assistance over the last two years. Hart House Warden John F. Monahan spoke at the reception, recognizing the effort of students and volunteers behind the program. Robert Martin, the group's co-founder, said the initiative has received a lot of media attention, and the Greater Toronto Area community has also pitched in. NMC-CESI has been able to organize field trips to the museum and, thanks to the Jays Care Foundation, were able to have students and newcomers watch a Blue Jays game in a private box. “Not only are Syrians learning English, but the volunteers and U of T students, they’re learning Arabic. Everyone is benefiting from this,” he said.